Searching for a Home Appraisal in Cypress, TX? As one of the leading providers of residential and commercial appraiser services in the Cypress market area, our certified appraisers can help you with valuations for both private and lending use. We aim to provide an appraisal service that exceeds our clients expectations and is delivered with an industry leading turn time. We have some of the best appraisal fees in the area and we take pride in delivering reports faster than the average appraisers. All of our appraisers are Houston area locals and have over a decade of experience in the market area. We staff appraisers capable of handling any assignment from residential, commercial or mixed-use. If you have a commercial property that needs appraising our staff of Texas Certified General appraisers can provide you a quote based on the assignment details. Furthermore, our appraisers are able to provide valuation services for any use including lending, private matters, insurance, legal issues and any other situation that requires an accurate and reliable property value. Be it homeowners or industry professionals, our dedication to you remains the same – to provide a reliable and courteous appraisal service. Should you have questions, or do not see the exact service you need, you can use our online contact form or call us directly at the number listed on this page. Getting scheduled takes minutes! 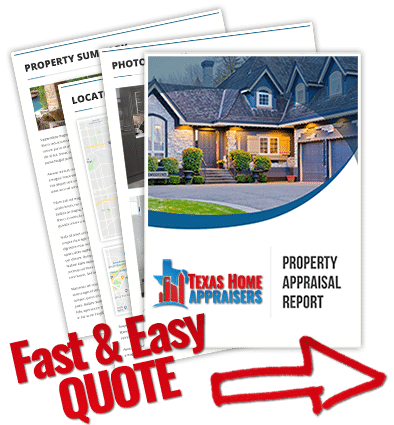 Simply complete the web quote request form or dial the number above and one of our certified houston house appraiser will be happy to talk about your appraisal. For a lender transaction a higher appraisal will have no impact on your loan at all because lenders use the lower of the appraisal value or the sales price to determine loan details. It would only impact you if the value came in lower than your sales price because now your loan number would need to be re-worked. The good news is that you now have built in equity in the home. The only people that will see the appraisal are you and the lender so the seller will never know the appraised value was higher. Though most of appraisers steps in providing a value are done from their office, the appraiser’s first step in the appraisal process is defining the problem, or scope of work pertaining to the property being appraised. The appraiser will generally consider only permanent fixtures and real property. This information will help to assist the appraiser throughout the valuation and comparison process. Only by measuring the outside of the property is an appraiser able to calculate the gross living area of a property. Non-living areas, such as garages or covered porches, aren’t included in GLA, but are accounted for and considered in value separately. The appraiser is not a whole house inspector, engineer, architect, electrician, plumber, HVAC technician or contractor. An appraiser walks the outside of the property to get a basic idea of the outside condition. He is usually looking for obvious deficiencies in roof, siding, and foundation as well as a general assessment of interior conditions with relation to properties in the immediate neighborhood. An appraisal is not a guarantee of condition. It is the appraiser’s job to ask certain questions regarding the condition that may affect the value. You are encouraged to seek the advice of experts if you have any questions about the structural or mechanical aspects of the home. Absolutely not! Only appraisals initiated by request of a lender(bank) on behalf of lending, will be made public knowledge and shared with local tax authorities. A private appraisal is solely for the use of the individual and isn’t shared at any stage with outside parties unless deemed for the benefit of the individual, such as an opportunity to contest tax values.